We journeyed to Jefferson City this morning, checked in at the House Communications Office and then set up our still cameras in a side gallery. Over the course of the morning session we had conversations with Representatives Joe Aull (D), Jason Kander (D), Chris Kelly (D), Jill Schupp (D) and Mary Still (D). 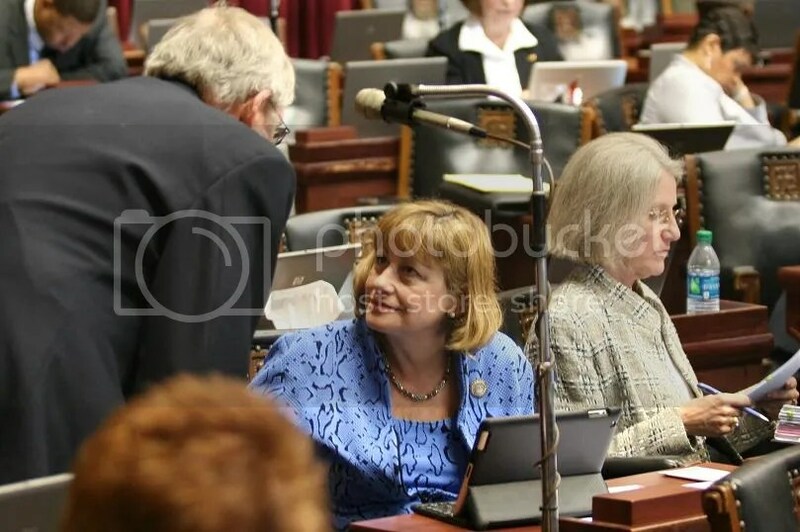 Representative Denny Hoskins (r) crossed the aisle and we had a lengthy conversation in the side gallery about redistricting and its aftermath, the budget, revenues, and HB 1229. Speaker Steve Tilley (r) at the dais. 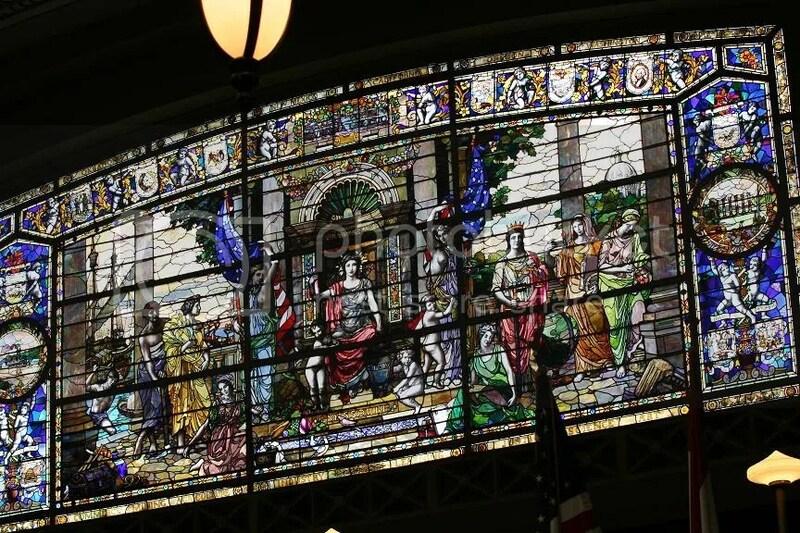 Stained glass above the press gallery and dais in the House chamber. Old media in the press gallery above the dais. There’s a lot of space up there, but not very many people occupying it anymore. One gets the feeling that the paradigm has been changing and it isn’t finished just yet. 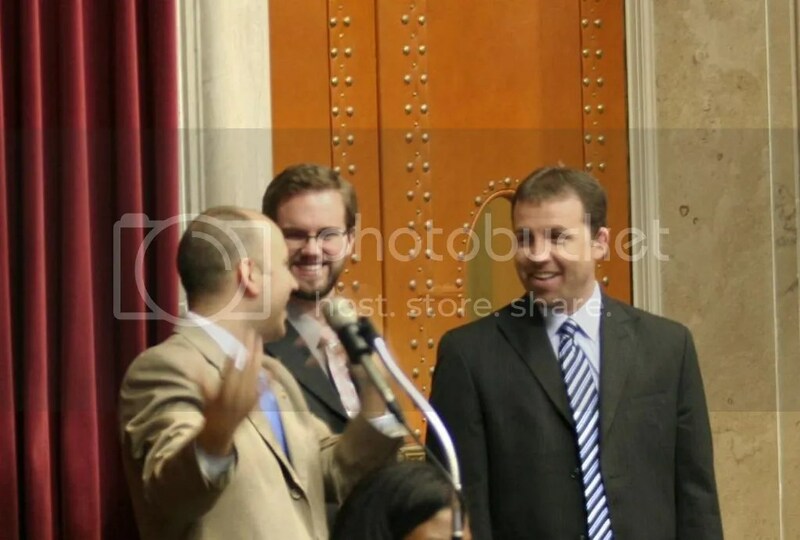 Minority Floor Leader Mike Talboy (D-37)(left) and Speaker Steve Tilley (r)(right) in conversation at the back of the House chamber. 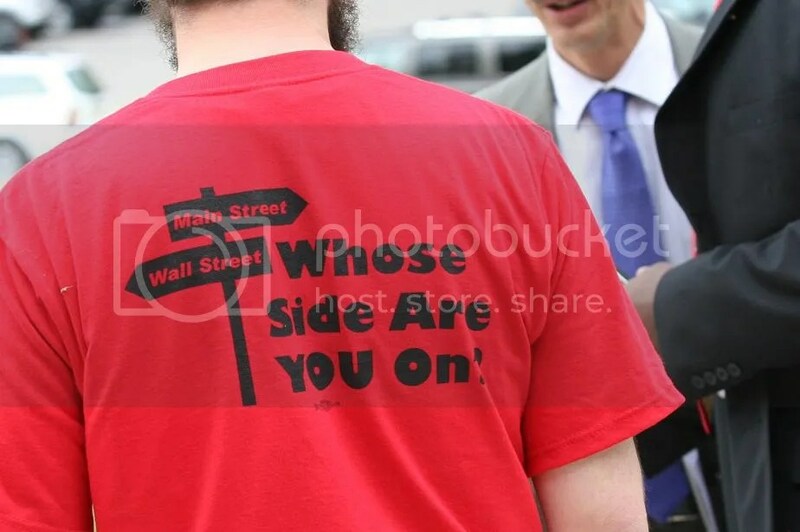 After the noon recess in the House we encountered American Federation of State, County and Municipal Employees (AFSCME), Service Employees International Union (SEIU) and Communications Workers of America (CWA) members with signs marching to the Capitol steps. After a few cheers the union members were instructed to leave their signs in a pile for collection before the went into the building. Later in the afternoon we encountered small groups in the halls and offices speaking to individual members of the House. As the AFSCME, CWA and SEIU members gathered in front of the steps Representative Mark Parkinson (r) was exiting the building. We greeted each other and had a pleasant enough conversation. 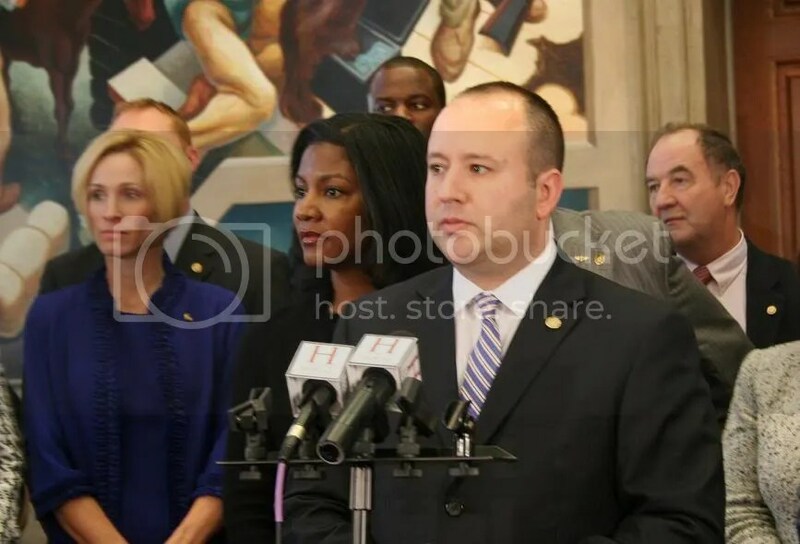 Apparently, Representative Parkinson believes public workers should be happier then they are. …. [5:40] Obviously this is not a economic climate that is going away anytime soon. So we need to take a very strong and hard look at what we can do as a state. And unfortunately we’re in the minority so we don’t necessarily get to drive the legislative agenda. But you can rest assured, as I told you all on the first day of session, as I told you when we broke for Spring recess, and as I told you at the end of session and I told you every time we’ve been in here, first and foremost we need to talk about two things in this state. One, jobs, getting people back to work, and making sure that we have an educated work force to fill the jobs that we do create. Those two things moving forward are the most important. We can do nothing else and those two things two things need to get done. Unfortunately we’ve wasted now way too much time talking about it but not doing anything…. 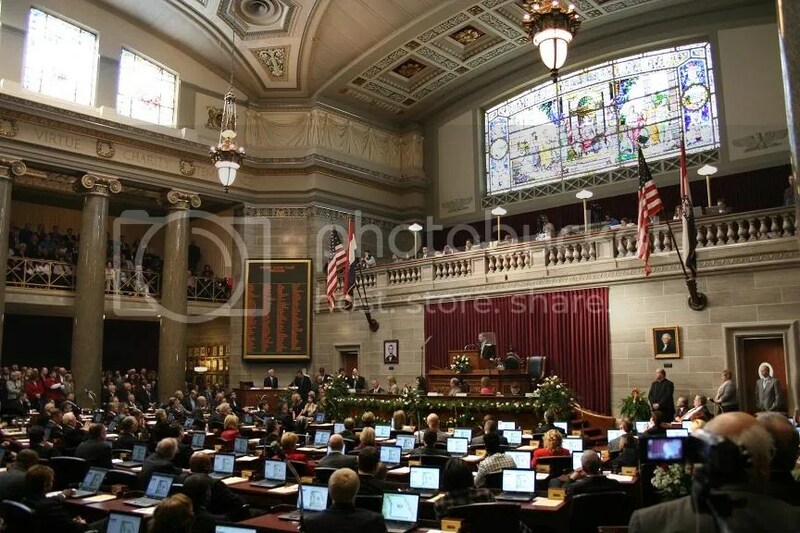 The price tag for Missouri’s special legislative session has reached nearly $280,000, KMOX reports. Figures from the 159-seat House show members have racked up more than $233,000 in per diem and mileage expenses. The 34-member Senate has incurred more than $46,000 of expenses for per diem, mileage and staff costs…. Not to mention the jobs situation in this state, too. in the House Lounge for the House Democratic Caucus press conference on January 5, 2011. 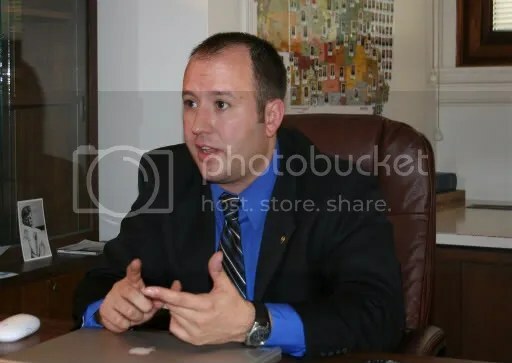 Representative Mike Talboy (D-37), House Minority Leader: …If you have any questions just go ahead and, uh, let us know and we’ll get either myself or the appropriate member up here to talk about whatever you have questions on. Question: How are you guys, it’s a small group, gonna align against the Republicans when they try to steamroll you on everything? Representative Talboy: Well, quite frankly, in the minority, um, it, it’s no different. We have thirty-five thousand five hundred people in each of the [inaudible] represented . We have fifty-seven districts that expect us to come down and represent what is important to them and we’re going to continue to do that. I think we’re going to hold the majority accountable if we don’t agree with their ideas and we’re going to try to work together to make good ideas better. And I think that is quite possibly, you know, the best we can, we can offer our constituents. And it makes no difference whether we’re in the majority or the minority, we’re gonna do the same thing. I, I think any Speaker, whenever they don’t lose the speakership or the majority always thinks they have a mandate. 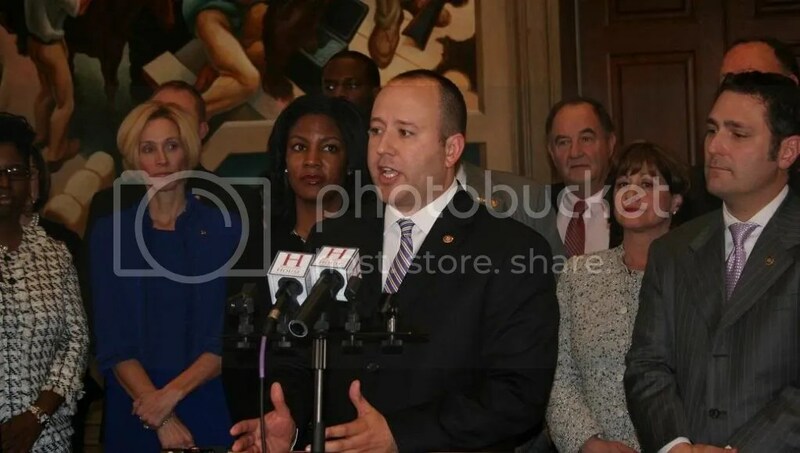 I don’t believe that anybody has a mandate on being able to represent the best interests of the State of Missouri…. ….Question: Of all what’s outlined in the Showme Initiatives that he [Speaker Tilley] did what parts might you agree with what might you think are objectionable? Representative Talboy: Well, uh, you know, I, it, it’s one thing of those things the devil’s in the details. I mean obviously this caucus has, has been fairly vocal on a couple of the issues that he’s brought up. Uh, you know, the first [inaudible] the overall costs you’re talking about, um, what significant programs are actually going to entail, implement, and to actually carry out. I think those are, you know, two of the points. You can talk like, one, about what these programs are gonna be, but if you don’t have a true valuation on those you may actually be spending us, spending us into even further economic problems than we have currently. 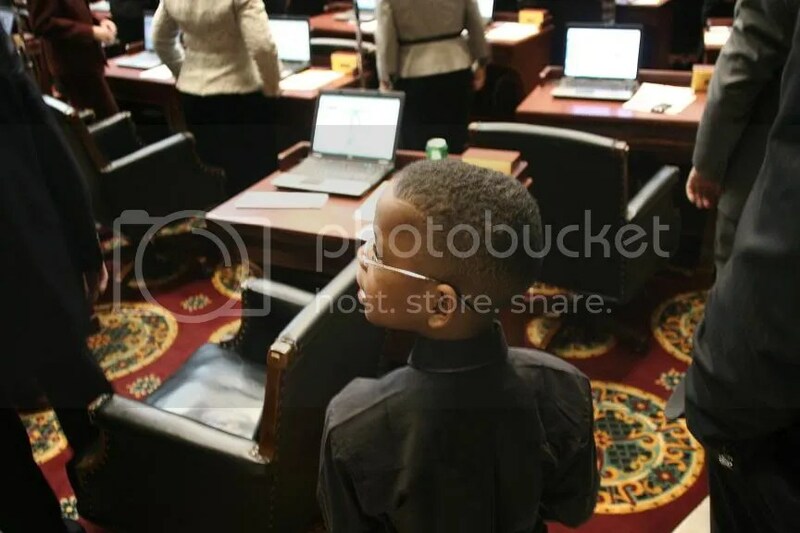 And, well, I think that if you look at, uh, I know that there was great debate last year on the [inaudible] issue and I think that when you look at the overall cost of that program, while it makes for good headlines, the implementation may be disastrous to our state budget. Question: What about education? Um, obviously just to talk about a lot of cuts there. [inaudible] Kansas City, I have a lot of friends there who are concerned about that district losing a lot of money [inaudible]. Representative Talboy: Yeah, I think that, uh, what we have to do is really get into the, the nitty gritty of what happens in the education process and talk about changes or, you know, reform or whatever you want to call it, we need to absolutely positively make sure that we aren’t harming the system in our zeal to try to try something new. And I think that is first and foremost what we need to make sure that we have our education professionals, the Sarah Lampes, the Genise Montecillos, the Joe Aulls, the Ira Anders and, and everybody in, in my caucus and everybody in theirs sit down and actually talk about what happens when some of these things hit classrooms. And what that effect has, not only on the teachers and the students, but the ability for the students to get to school, learn, and everything in between. Question: Uh, seems like a pretty wide consensus that job creation/economic development should be the top priority this year. Where do you think this consensus [inaudible] ? Representative Talboy: I think that in the House we haven’t had much of an issue as far as creating, uh, jobs packages and in getting them out with a wide, uh, swath of both parties supporting. Those traditionally have failed over in the Senate and, and have bogged down repeatedly over there. I think that now is the time we take a look at every program that has been implemented, that we are currently using, that has been proposed before, new proposals based on either one of those, or coming up with something that is so far fetched, but having that discussion, neither party has a patent on good ideas. And I think that that’s the one thing when you’re talking about job development that we need to make a concerted effort to do is make sure that both parties are at the table, we’re sitting down and examining every possible idea because we are in a very tough spot right now. Question: Uh, how about the, uh, a lot of industrial business groups were in the capitol yesterday [inaudible] six priorities that [ inaudible] Republicans [inaudible] today [inaudible]. Representative Talboy: You know we haven’t gotten most of the details on some of those, but I, I think that I look forward to having those discussions and I think that we can, uh, talk to them and see where we might be able to agree or where we might be able to make agree, uh, a bill that we disagree with better. Uh, I, I think that when you’re talking about a tax increase you can [inaudible] , you know, you have a lot parameters that go along with the tax increase. And when you have say, a cigarette tax has been proposed or some of these other things that have been proposed you have to look at what their overall valuation to the bottom line of our, our state budget and what harm to the folks in the state actually would be. And I think that’s one of ’em where there might be some consensus to talk about. There might be some, I think streamlined sales tax I know that that’s been brought up as far as collecting uncollected taxes and those, uh, states are moving towards implementing a streamlined sales tax for Internet sales. I think those are two things that you have heard a lot about and would be worth discussing. Question: What are your thoughts about the possibility of giving the House Budget Committee subpoena powers? Representative Talboy: You know, I , that was a, a new thing for me. I hadn’t heard that one in a while. And, uh, you know, I think that it’s gonna be interesting. I’m interested to see what act, what Steve and, and the folks in the Speaker’s office want to do with the budget committee and what Chairman Silvey is going to actually do with those subpoena powers and how they’re going to execute them. You know, throwing out there and saying we’re gonna have subpoena powers, what they’re actually gonna be used for I think is going to be [inaudible] telling than any [inaudible]. Question: [inaudible] understanding what might motivate that proposal? Representative Talboy: No. That would be a question that I would ask him. I, I probably have the same question you do. Well, I think that any time you start talking about, uh, subpoena powers , subpoenaing witnesses, it always, by its very nature, becomes a adversarial type of a, a situation. And I hope that it’s not going to make things more partisan and I hope that if they are going to have the subpoena power that they use it responsibly. I, I haven’t experienced any issues having, uh, having a free flow of information, communication lines being open. ting off amendments on bills on the floor. What do you think about that? Representative Talboy: Well, I, you know, it, it’s interesting because I believe in the new Republican, uh, Congress in Washington, D.C. actually got rid of the closing of the bills in the rules committee, uh, after a couple of, of people complained over this last General Assembly that they had about what, uh, what the impact of that was and so I think that might be something we need to talk about. No, I think that having the discussion, I’m open to talking about what the, that rationale would be or how you were going to use it, but I don’t think that that is something I would say absolutely positively is, is going to be a good idea to do under rules. And especially if, if you have the folks that just had it implemented on them talking at the national level about what a disaster it was, so much so that they got rid of it. Uh, I think that’s a conversation worth exploring and I, I continue to believe that. Question: Speaker Tilley also talked, uh, in his speech about, uh, restricting driver’s licenses for people who [inaudible] speak English well enough to understand the test. Um, do you fear that that’s gonna be [inaudible] working legal residents, um, lose their transportation? Uh, I think I’m, I, my voting record’s pretty clear on, on that issue. I, this is my, beginning of my fifth year in this, fifth year that I’ve heard [inaudible]. 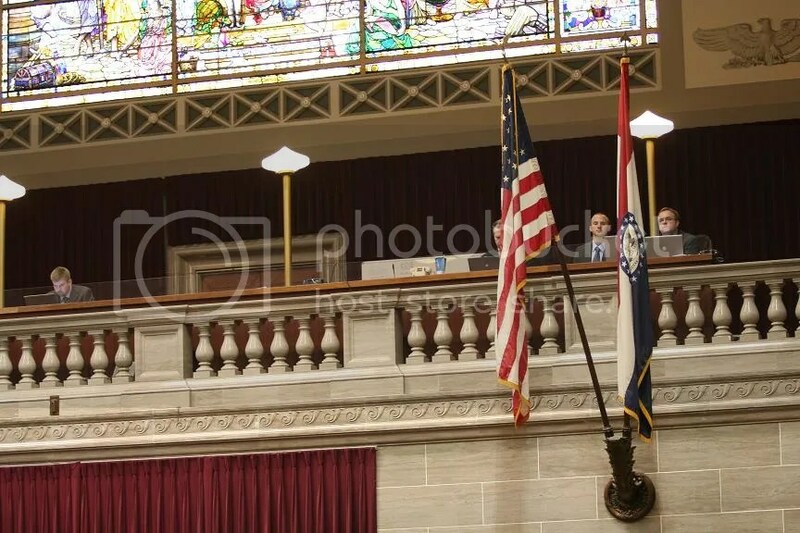 It’s the first time in the Speaker’s address, when I first came down here Speaker Jetton talked about having English as the official language of the State of Missouri and they’ve I think tried to figure out new ways to re, repackage the same deal. I, I hope that they don’t use the, the process to be partisan political, uh, with the representation of the 40th District in the State of Missouri. What we, what we know is there are, uh, two levels of, of the courts that have heard this case. They have both adjudicated it. It was a unanimous decision at the Court of Appeals. And unless there’s some evidentiary, uh, arguments that are, are contained that have not been brought forward and, and litigated I, that, that would be news to me. Question: Representative Rizzo is here, um, I guess taking part in everything do you have any, uh, concerns that the investigation will lead to him being taken out of his seat? Representative Talboy: Uh, again, I still think that you, you have to have a, a understanding and a respect for the, the law as written. Aand the evidence that’s been presented has not been able to overturn the law as it’s [inaudible] anything. Question: So, so are you basically saying if Tilley starts up a special committee to take a look at this that they should just look at what the court rulings have already been and say that’s it? Representative Talboy: I think that’s a very good, very good starting point. If they find something that they think is, is there I’m sure that they will discuss it, but I, again, I don’t think with as much media’s attention that has been given this, uh, this election, and it’s an August election, very beginning, we’re still talking about it the next year. Uh, I think that if there was something new under the sun we would have seen it by now and it would have been appealed to the Supreme Court. 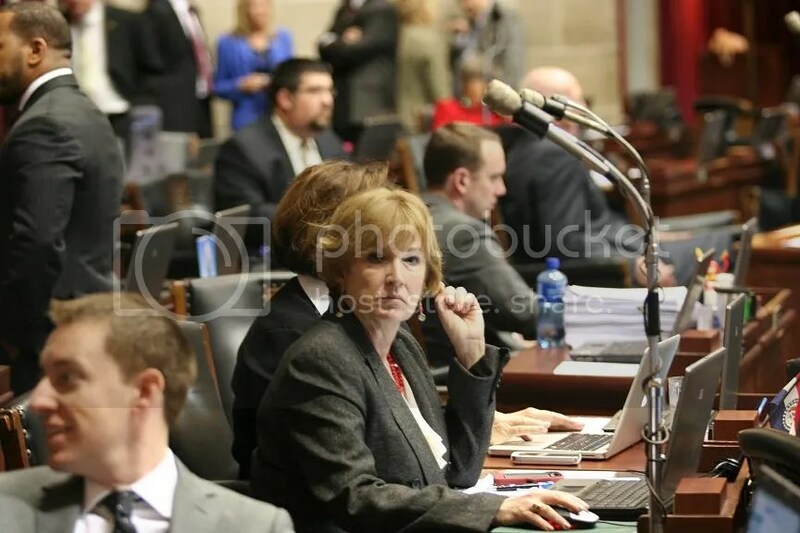 Representative Talboy: And that’s, and again, that’s why I hope the process does not become political where you have the Speaker who endorsed the opponent in, in the Republican primary getting into party nomination processes. Question: How would you characterize your working relationship with the Speaker? Question: The last two years, or last six? 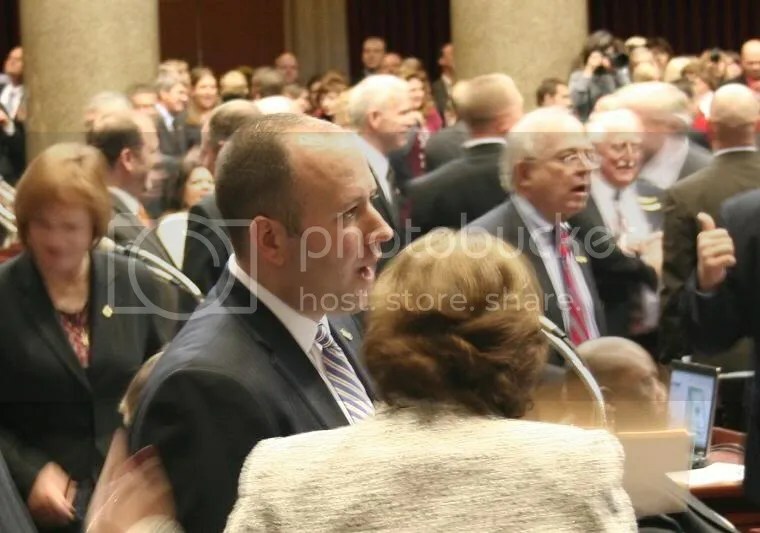 Representative Talboy: …speak for, for Paul LeVota and to Rod Jetton and their relationship when, when they were there but I do know, being very close to the situation between, uh, Speaker Richard and, and Leader LeVota it was not necessarily the greatest of times. Well, I think that you always pick and choose your battles. You don’t want to just argue for the sake of arguing. [inaudible] I don’t, I don’t think that gets us anywhere. I don’t think that’s ever gotten anybody anywhere. I think that what you, we need to do is make sure that if we disagree that we make sure that we express the reason we disagree, viable alternatives, and if we agree, discuss why we agree. And if we have ideas on how to make bills that we disagree or agree with better we need to express those points. Even if we know that they have the votes to pass the bill it doesn’t necessarily mean that we can’t get up and talk about why we think what’s contained in those bills is an issue. And I think that being able to make sure that the citizens know what is in those bills and how that’s going to affect them on a day to day basis is absolutely something that we need to have. Question: Do you worry about the numbers at all, like three votes short of an override majority, if three of your members move over they can override the Governor? 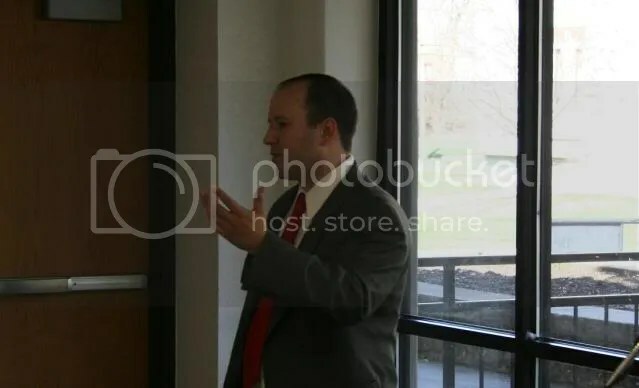 Representative Talboy: Well, I think that’s, I, I’ll worry about that when we find something that’s gonna be possibly be overridden as a veto but I, I don’t know, being able to tell you that, if I have any reason to worry. But I believe in my caucus and I believe in my caucus members and if they have an issue with something that they fundamentally and, and deep down in their core needs to be one way or the other then they’re gonna give reasons for it and they’re here to, they’re sent here to do a job and you have to respect the, they know their constituents best. 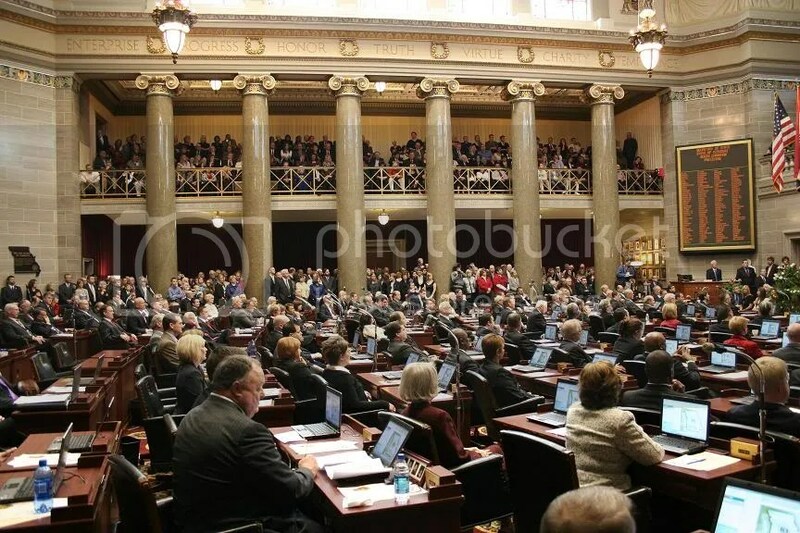 The 96th Missouri General Assembly went into session yesterday in Jefferson City. 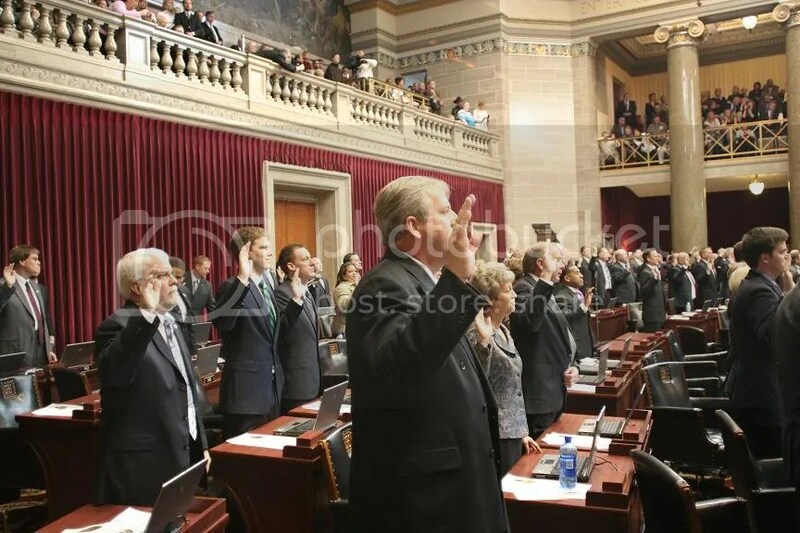 New members were sworn in, leadership was elected, and business has started in Jefferson City. One of the first orders of business was the election of the Speaker of the House. The minority (Democrats) nominated representative Mike Talboy (D-37). Representative Mike Talboy (D-37), the new House Minority Leader. 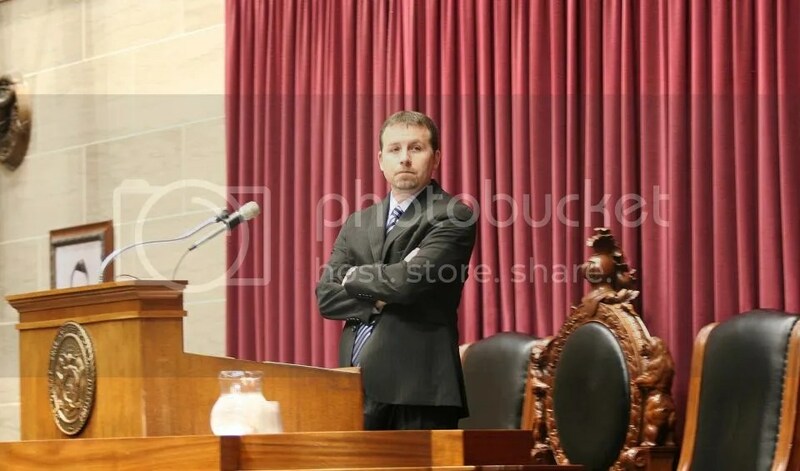 The Missouri House has tough work ahead of it, so I won’t take up everyone’s time with a long speech. Missourians and their families are struggling and we must work to fix this situation. The No. 1 priority of both parties this year must be to preserve and create jobs to help restore our state’s economy. 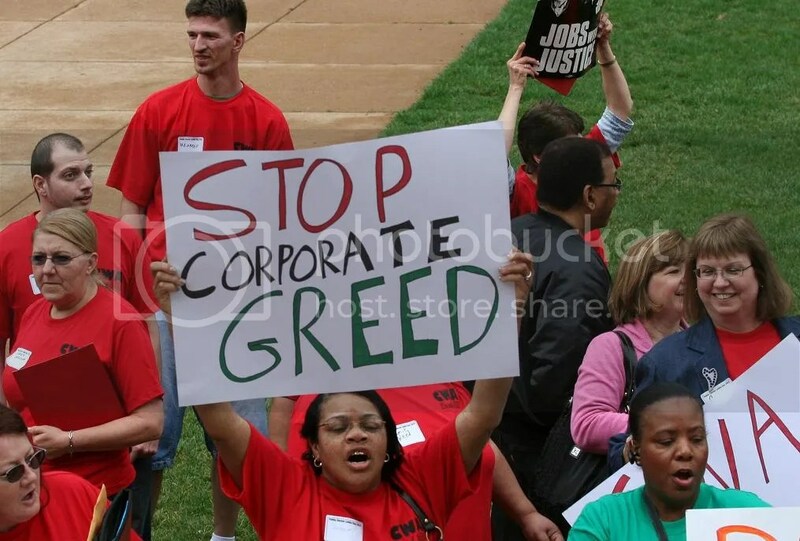 However, in our efforts to make Missouri more “business friendly,” we must avoid being anti-worker. While it is often said that businesses create jobs, it is really consumers who create jobs, because they are the ones who choose to buy the goods and services that make it possible for businesses to exist. 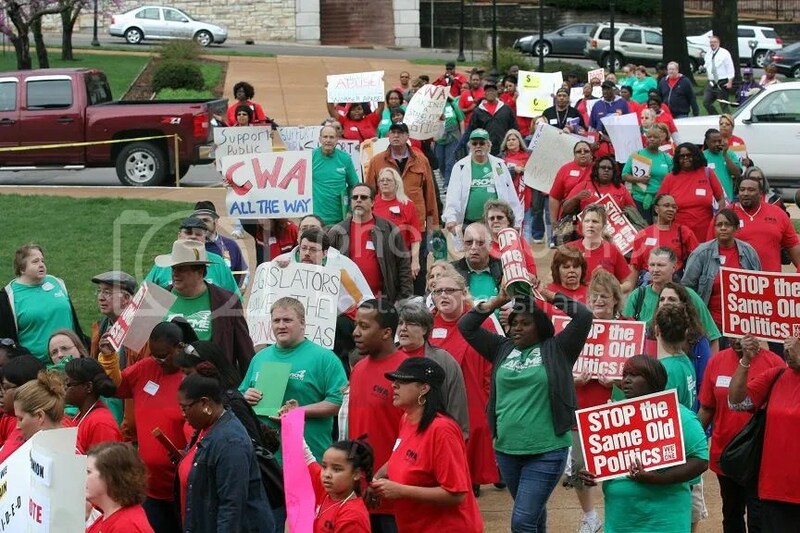 Policies that purport to help businesses by reducing wages ultimately hurt businesses, because it means hard-working Missourians have less money in their pockets to spend. Education is the foundation for success and economic growth in our state. We must take steps to make sure we do not decimate our education system to ensure we have the educated workforce to fill the jobs we create. Investment in education is critical in attracting new businesses and the expansion and retention of existing businesses in Missouri. Republicans have the numbers in the House to do whatever they want on virtually every issue. For our part, House Democrats will do our best to keep the majority accountable and work together to find solutions for these challenging times facing Missourians. Although the majority party has increased power, it comes with increased responsibility. 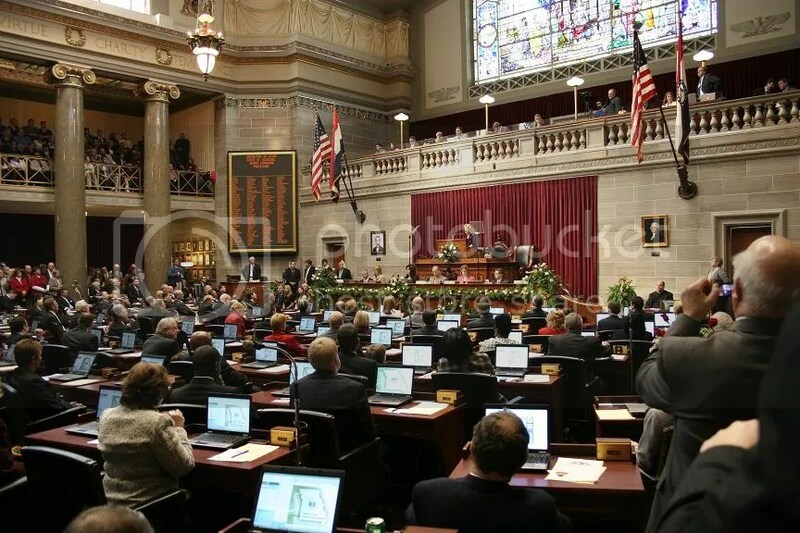 All of Missouri will be watching the decisions House Republicans make. And ultimately they will be held responsible for those decisions. House Democrats will offer concrete and realistic ideas to put Missourians back to work and create new jobs in our state. We stand ready to move Missouri forward and we are ready to go to work. I am honored and humbled to be nominated as Speaker of this esteemed body, however, I respectfully decline this nomination. Representative Steve Tilley (r) was elected Speaker by acclamation. 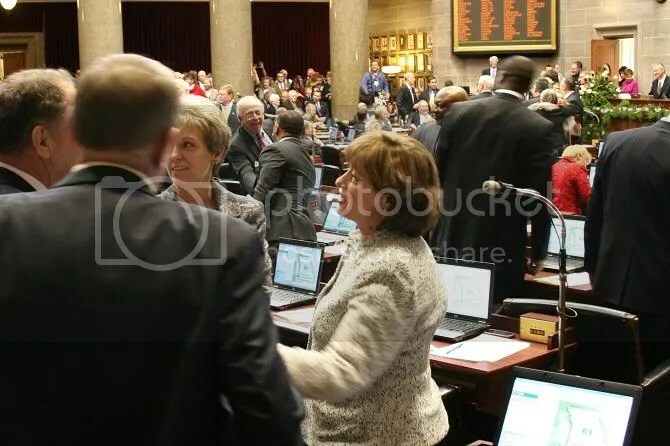 Representative Jill Schupp (D-82) in conversation with colleagues on the House floor before the start of the session. 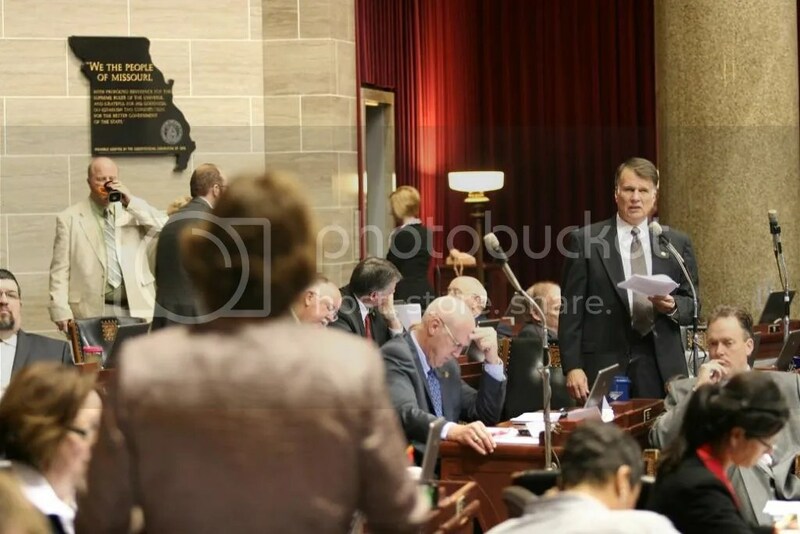 Missouri Secretary of State Robin Carnahan (D) starts the proceedings of the House. Members of the House take their oath of office. Speaker Steve Tilley (r) addresses the House. Representative Mike Talboy (D) speaking to students at the University of Central Missouri. 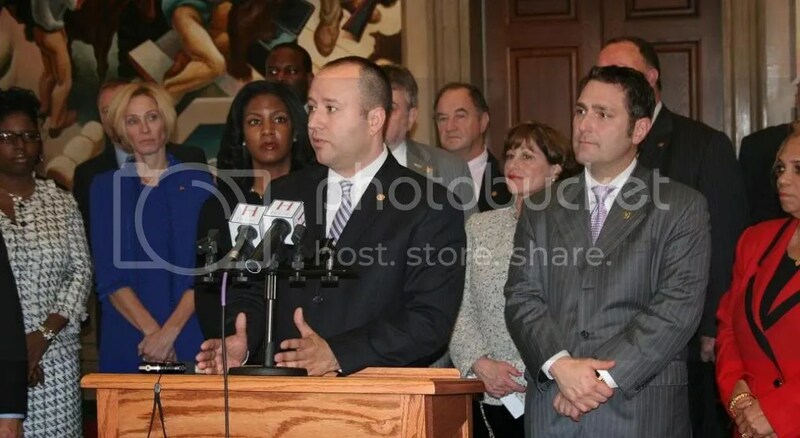 Representative Mike Talboy (D-37): ….I’ve been in the legislature for four years now. I, uh, I’m heading up the campaign committee for the House Democrats and I also have been selected by my caucus as the Democratic Leader-elect…. ….If you’ve watched what’s going on in Jefferson City the last few years, aside from the news about the FBI investigations or anything like that, you know that we have no money. And I wish I could tell you that it was gonna get better. But the bad news is that we are going to have even less money next year. Uh, we’re looking at about a billion to a billion two shortfall and the reason that things aren’t that bad right now is because we have a little left over stimulus money that, that came in and gave us a cushion at the state level. The problem is, is that that money’s all going to be dried up and we may have just a tad bit that will come in because of the jobs bill, maybe three hundred million, and that’ll keep us from going completely into the one and a half to one point six billion dollar shortfall possible. Uh, the, the environment down there is about like what you’d expect it to be. It looks a lot like the, for anybody that watched the health care debate, it looks a lot like that on a, on a daily basis. Oh, and they actually, probably are a little more civil day to day. Uh, it’s always funny because you hear about the, the party in power will always say that the party in the, in, in the minority is always doing obstructionist work and, and they’re, they’re not really coming to the table. Or they’re, the minority will always say they’re not being included. And so it’s always very interesting to watch the dance that happens in, in Jeff City. ‘Cause we’re in, we’re in minority. We’re eight seats down. But we actually had the guy who, if the, the Republicans stay in power, is talking to us about his bill about opting out of the health care bill and trying to put the constitutional fight that all these states want to get in to, actually on the ballot inside of our Constitution in the State of Missouri. Well, the, the interesting part about the whole thing is they shut off debate during that bill. On us. While they were complaining about the majority party at the federal level not allowing the minority party at the federal level to have a voice in the process. So, it’s, it’s one of those things that regardless of, of what the environment or who’s in power or anything like that, the House of Representatives is not the deliberative body that the Senate is. It is very much a tyranny of the majority. It is very much a whoever’s in power, as long as you have votes to do something you’re gonna get it passed. And so it, it’s been interesting ’cause we’ve had a lot more people take interest now that the, the health care debate was on TV at such a wide, uh, audience that I can’t remember any other kind of, of, uh, C-SPAN audience actually have that many viewers at any one time. Uh, matter of fact, I think the only time I’ve ever, I’ve seen that much interest in anything that was going on inside Congress, the day to day, was Anita Hill and, and Clarence Thomas. And you are all probably way too young to remember any of that…. ….But the interesting part is that we have become very divided along all sorts of different lines. It’s happened at the national level, it’s happened at the state level, and it’s, it’s probably going to get a little bit worse before it gets better. The good news is that usually throughout history these types of things do end up getting better. But, it takes a while for it to cycle back. Uh, we have some things that are, that are moving forward in the legislature. But again, when you don’t have any money and you’re actually taking money out of programs it’s very hard to try to actually advance anything because it, passing legislation usually has some sort of fiscal impact on the state to it. And right now the, the big thing is this new DWI bill that, that the Governor had put forward and, and we debated on the floor. It’s probably not going to end up passing unless there are some significant changes to it because of this simple fact. And it’s amazing, the warrantless blood search is probably, you know, the fact that a guy fresh out of the police academy can come in and take your blood without a warrant, uh, plays no factor in that. It’s simply a monetary problem. It’s [inaudible] we can’t fund it. If we actually put it in we would completely tax the law enforcement divisions of municipalities and counties. And so, a, a lot of bills are going to simply live or die based upon whether or not there’s any fiscal impact to the state…. Representative Talboy took questions from students for the remainder of the hour. Democrat Courtney Cole, an announced candidate in the 121st Legislative District, is challenging incumbent Denny Hoskins (r – noun, verb, CPA). 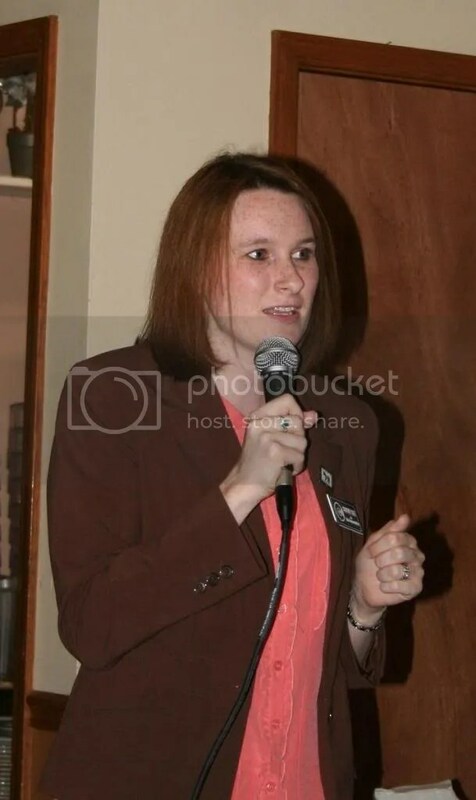 Her first fundraising event was held in Warrensburg on Thursday evening. 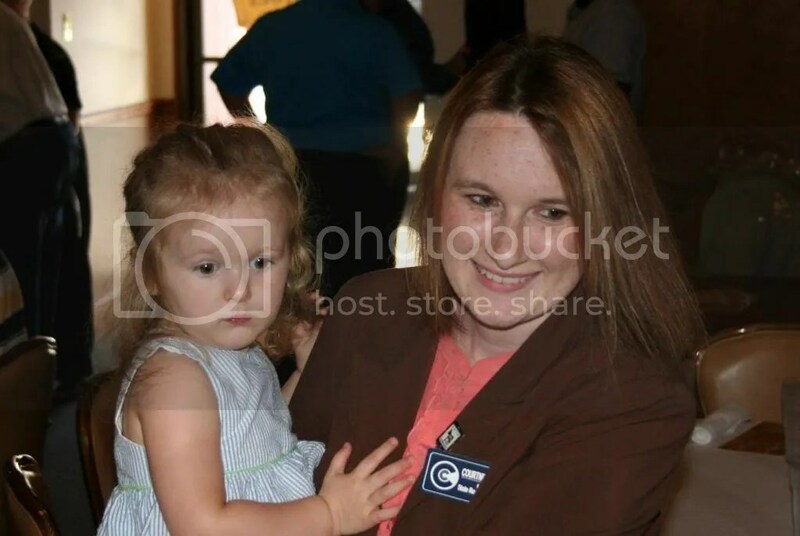 Courtney Cole, Democratic Party candidate in the 121st Legislative District, with her daughter Kenzie. 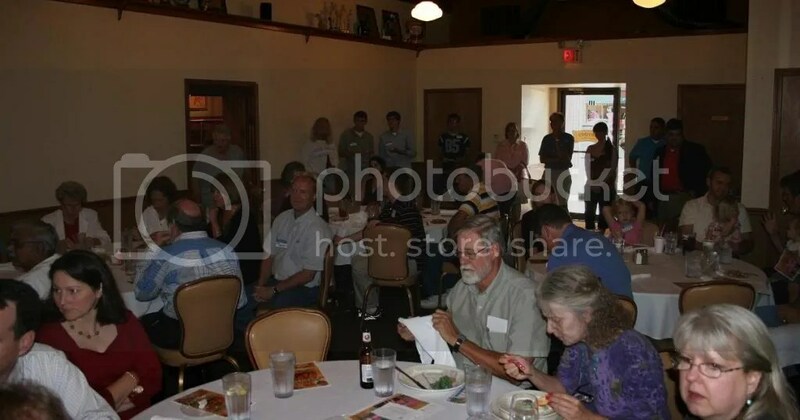 Over fifty people attended Courtney Cole’s first Warrensburg fundraising event. Representative Mike Talboy (D-37)) introduced Courtney Cole. …We have a real need for change here right now. And I think we all realize that…. 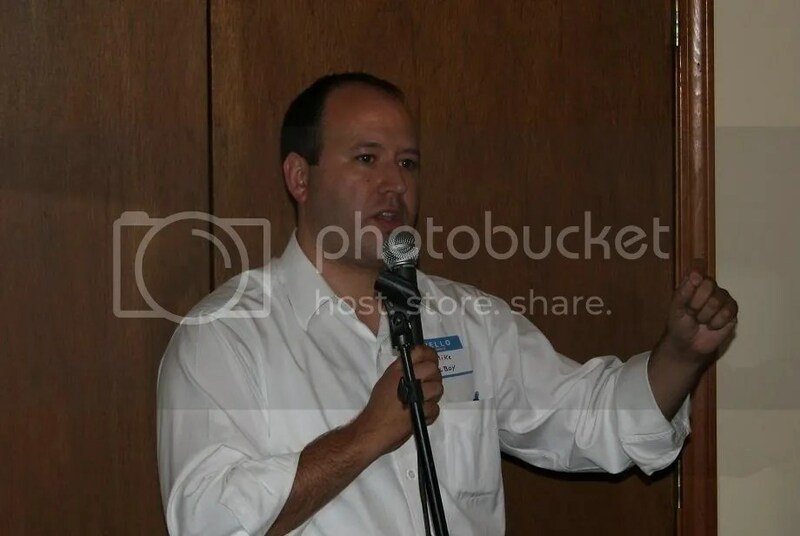 …I also want to thank the Johnson County Democratic Central Committee. And many central committee members are here tonight. And your early endorsement of me means the world. It’s so important to have that. [applause] Thank you. I’m honored…. …We all know why we’re here. It’s because we need change. It wasn’t that long ago, just about a year, really, after the election, that we all stood in this room…and talked about getting organized and making change and how important that was to realign our party. And to make sure that we’re making good steps so that we have that leadership representing us in the House or in the Senate. Because right now the Democrats, you know, we really don’t have a voice. We don’t have a representative….And it’s important for us to have that. I think that since that meeting last year we have made a lot of changes. And we’ve made a lot of changes for the good. And I think they’re seeing it. And I think that they should. And that’s why I’ve come out early. But this is gonna be a long race. So I’m gonna need your help. I really am. I’m gonna need your support. I’m gonna need your money. I’m gonna need your volunteer time. I’m gonna need your yard so I can put up a sign. I’m gonna need you to go out and walk with me in a parade. I’m gonna need you to blow up balloons and mail mail, stick stamps at the house. Okay, come on by. I’d love to have you….I appreciate your friendship and, and everything that you have given me so far. And, you know, this is my first fundraiser and I’m always gonna remember this. I’m gonna remember the faces that are sitting in this room right now. So thank you. Thank you so much. [applause]…. This will be a tough, hard fought race. The republicans will throw all the money the need into this one, but Denny Hoskins has accumulated a lot of baggage. Given his record he’ll be accumulating even more during the next legislative session. “Progress is the Law of Life” – When it comes the HB 11 the republican majority in the House evidently hasn’t read the inscription on the House side of the capitol building. Representative Mike Talboy: Absolutely. And that’s, I mean it’s the tyranny of the majority here. SMP: Has, has there been any, was there hope for compromise? Has there been any compromise? Representative Talboy: Absolutely. The Senate Republicans, the Governor, the Hospital Association, the Senate Democrats, and the House Democrats and, at one point, the House Republicans all agreed to this, you know, to the implementation of this program, to signing off on it. The language was put in the conference report and then the [Republican] majority party decided that they weren’t gonna honor their agreements that they had, had made. And you can’t, you can’t have a meeting of the minds when you’re not dealing with honest brokers. SMP: In, in the ensuing time from the conference to the vote yesterday, what changed for the majority? Has there been any explanation of this? Representative Talboy: I don’t think it was ever going to be, I don’t think it was ever intended to pass. I really don’t. I don’t think it was ever intended by the [Republican] majority in the House to ever let that language pass. SMP: So, you know, I’m confused in the sense where, did people think everybody was, did they profess that they were working in good faith? …SMP: You know, at this point, once the House votes on it, it’s, it’s a done deal then? Representative Talboy: No, it has to go back over to the Senate. And then, they can either adopt the committee report exactly as it is, or they can request that we do another conference committee. But my, my guess is they will adopt the conference report as it is. And then we’re stuck hoping that [SB] 306 could possibly be used to as the vehicle to put people into some sort of health care package. SMP: So, it’s, it’s one time money then? Representative Mike Talboy: Working poor. SMP: Working poor. And so the working poor are left to nothing. Representative Mike Talboy: Where they are right now. SMP: Nowhere. And in the debate had there been any discussion of the costs, monetary and to society, of having uninsured working poor? SMP: And in the sense that, you know, we, and, and this had no bearing on…? Representative Mike Talboy: Fundamental problem is that a majority of the majority party just does not care. Period. But they don’t care if those people, if they’re working then it should be up to them to find their own health care or for their employer to give them health care. But it’s not the government’s job in their, in their mind to deal anything with people that need it. And we’ve seen that time and time again. It doesn’t matter if it’s kids. It doesn’t matter if it’s parents. It doesn’t matter if it’s individuals that don’t have kids and aren’t parents. There’s a fundamental distaste for helping and investing in the citizens of this state. And, and unfortunately, it’s, it’s becoming like, it’s a situation where I think that they want to take India’s model and make a class system. And just do it by statute. That would be a good law of life, wouldn’t it? 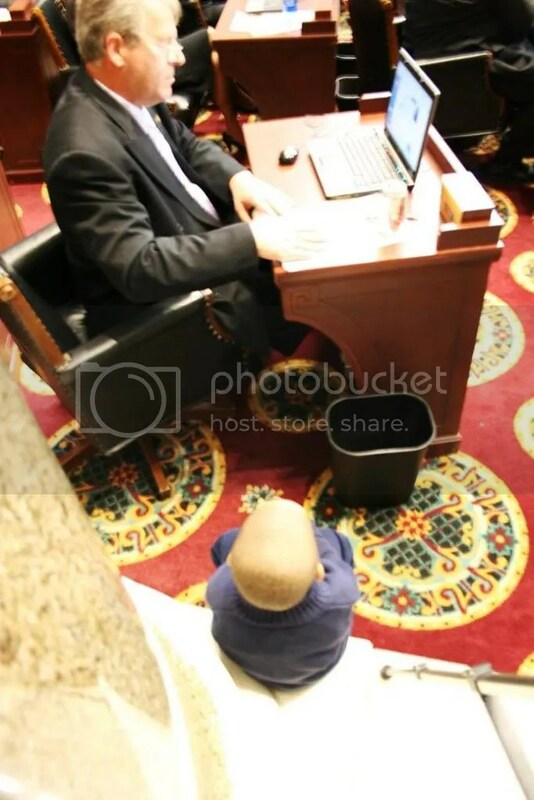 Representative Mike Talboy (D – 37) in his office in Jefferson City on the opening day of the legislative session. 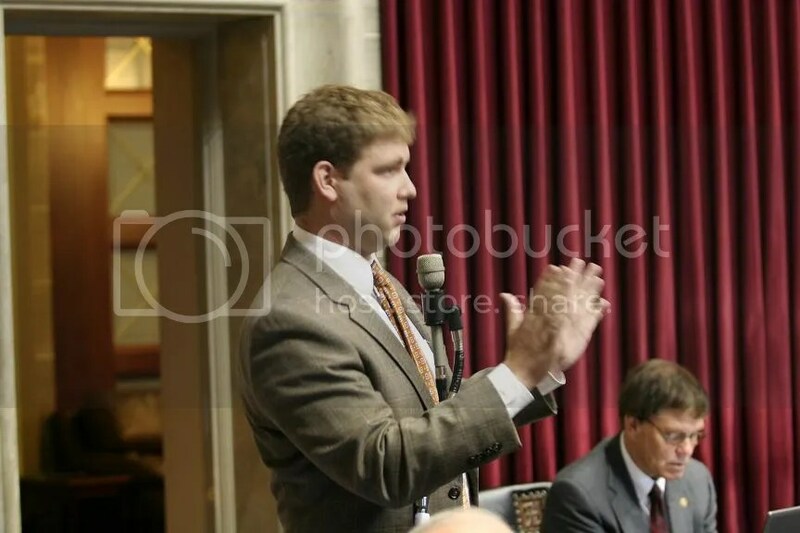 Serving in the minority party (in the “post partisan” environment fostered by the Speaker of the Missouri House) hasn’t put a crimp on the legislative diligence of Representative Mike Talboy (D – 37). Note to self: prepare to watch republican right wingnuts achieve a state of apoplexy. HB 584 Requires pharmacies to dispense all valid lawful prescriptions for contraceptives without delay. Note to self: prepare to watch republican right wingnut caucus express frustration over which bill should make them more likely to achieve the most complete state of apoplexy. He’s going for the trifecta! The republicans will not only vote “hell no”, they’ll do so to the person. You see, they don’t do so well in down ticket races when voters can vote straight party on the ballot. I bet you former representative Deleta Williams (D) is smiling! Now, that’s my kind of legislative agenda.